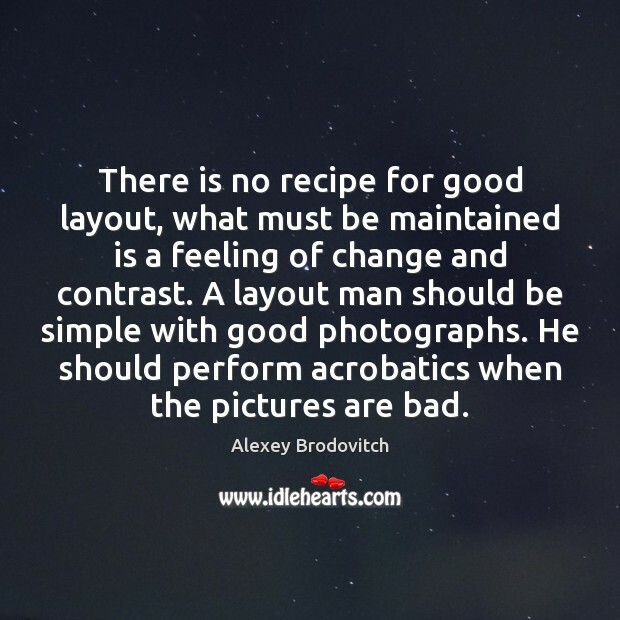 Enjoy the best inspirational, motivational, positive, funny and famous quotes by Alexey Brodovitch. Use words and picture quotations to push forward and inspire you keep going in life! 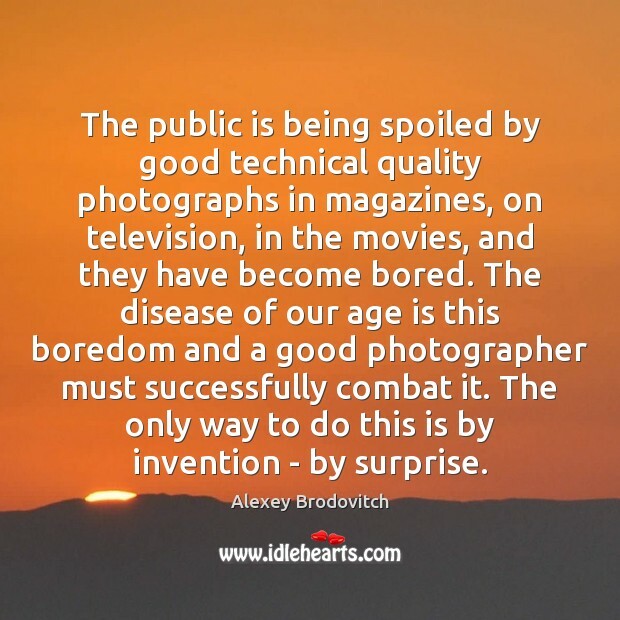 The public is being spoiled by good technical quality photographs in magazines, on television, in the movies, and they have become bored. The disease of our age is this boredom and a good photographer must successfully combat it. The only way to do this is by invention - by surprise. 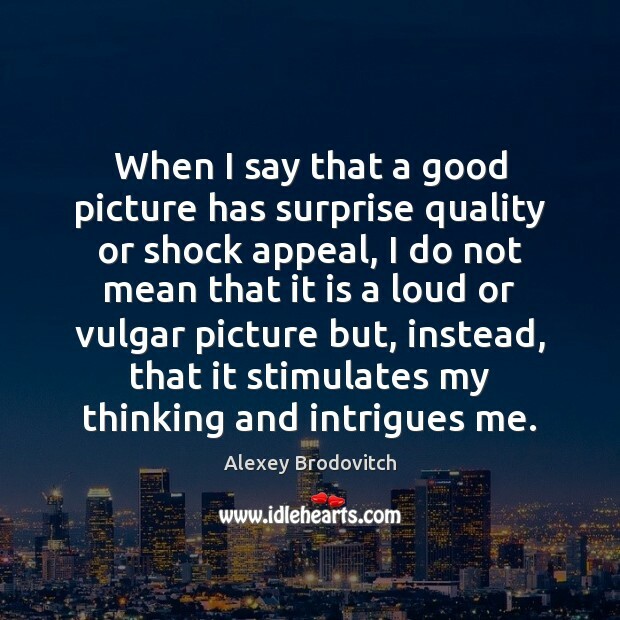 When I say that a good picture has surprise quality or shock appeal, I do not mean that it is a loud or vulgar picture but, instead, that it stimulates my thinking and intrigues me. There is no recipe for good layout, what must be maintained is a feeling of change and contrast. A layout man should be simple with good photographs. He should perform acrobatics when the pictures are bad. What is of value is that a particular photographer sees the subject differently than I do. A good picture must be a completely individual expression which intrigues the viewer and forces him to think. Photographers should make three or four prints from one negative and then crop them differently. 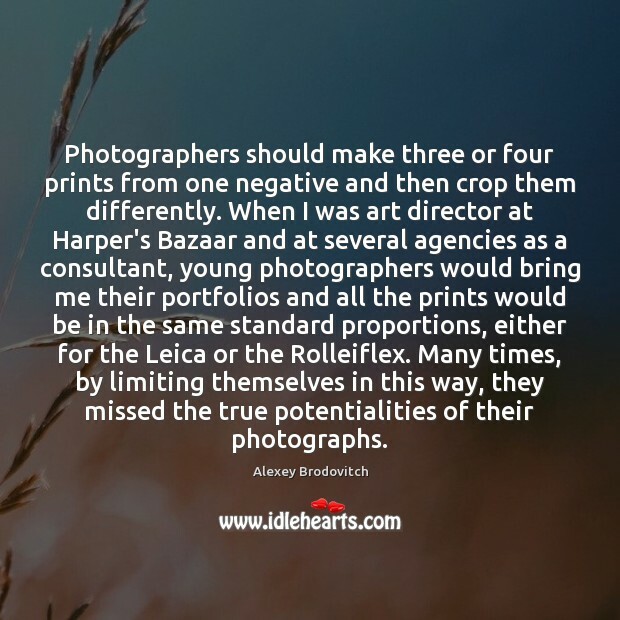 When I was art director at Harper's Bazaar and at several agencies as a consultant, young photographers would bring me their portfolios and all the prints would be in the same standard proportions, either for the Leica or the Rolleiflex. Many times, by limiting themselves in this way, they missed the true potentialities of their photographs. 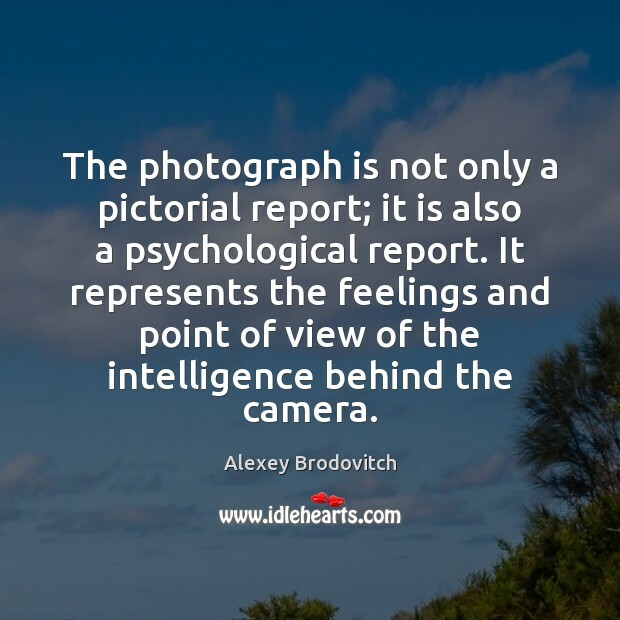 The photograph is not only a pictorial report; it is also a psychological report. It represents the feelings and point of view of the intelligence behind the camera. 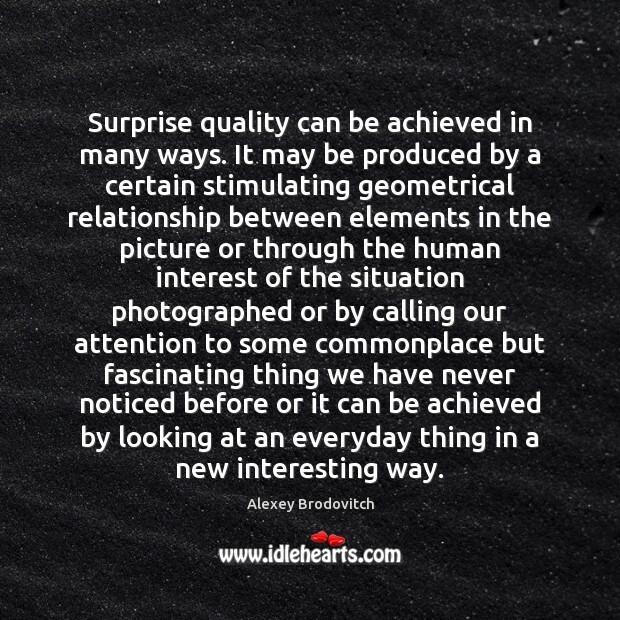 Surprise quality can be achieved in many ways. It may be produced by a certain stimulating geometrical relationship between elements in the picture or through the human interest of the situation photographed or by calling our attention to some commonplace but fascinating thing we have never noticed before or it can be achieved by looking at an everyday thing in a new interesting way. 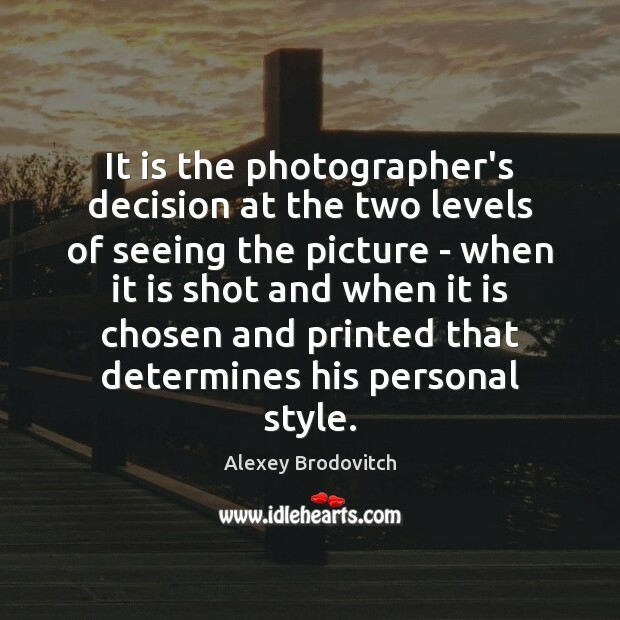 It is the photographer's decision at the two levels of seeing the picture - when it is shot and when it is chosen and printed that determines his personal style. When the novice photographer starts taking pictures, he carries his camera about and shoots everything that interests him. There comes a time when he must crystallize his ideas and set off in an particular direction. 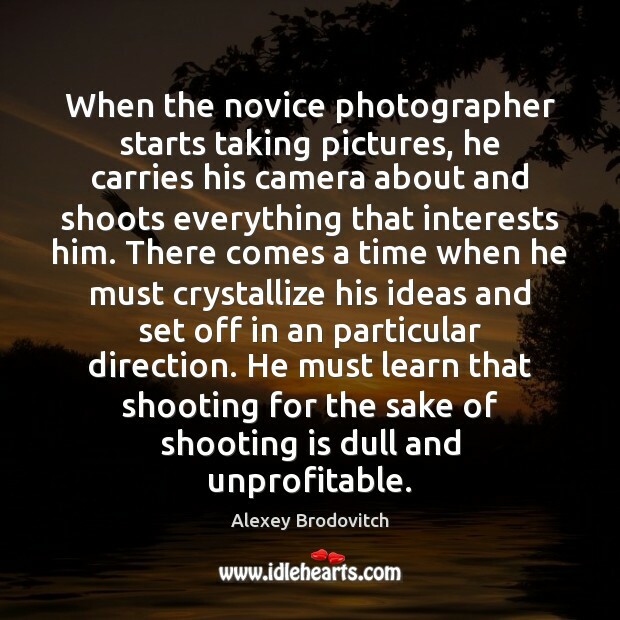 He must learn that shooting for the sake of shooting is dull and unprofitable. 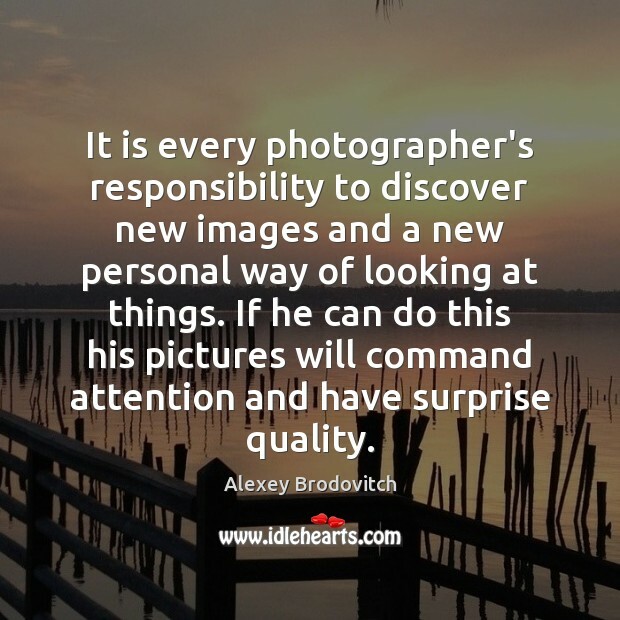 It is every photographer's responsibility to discover new images and a new personal way of looking at things. If he can do this his pictures will command attention and have surprise quality. 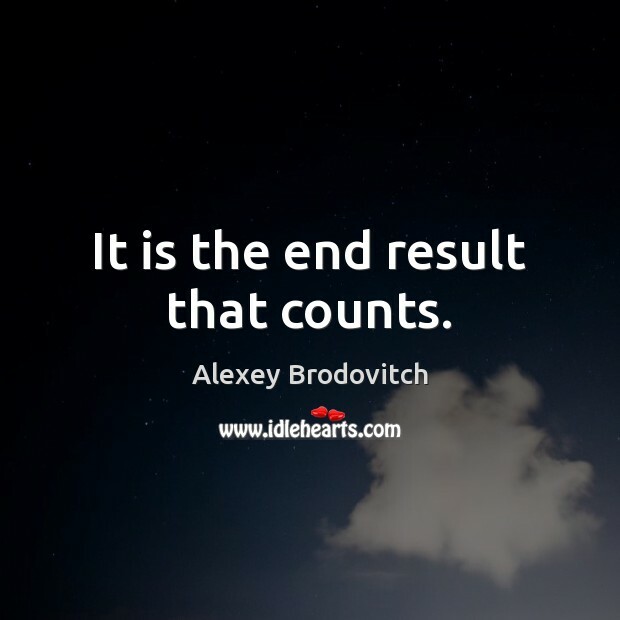 It is the end result that counts. 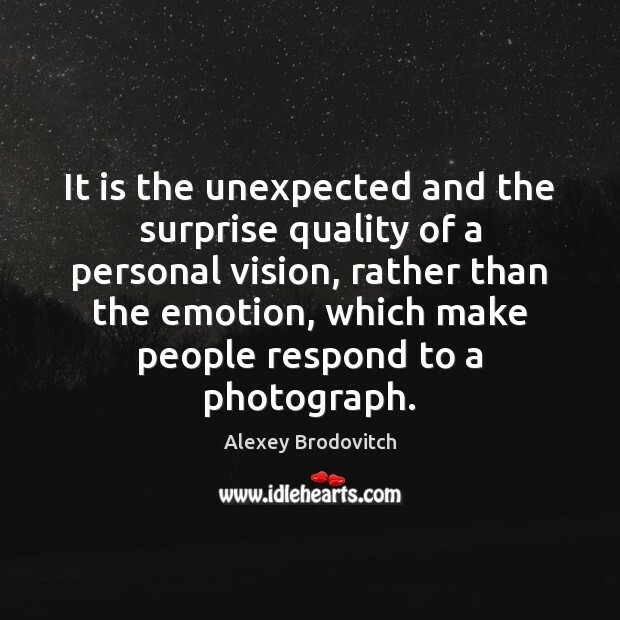 It is the unexpected and the surprise quality of a personal vision, rather than the emotion, which make people respond to a photograph. 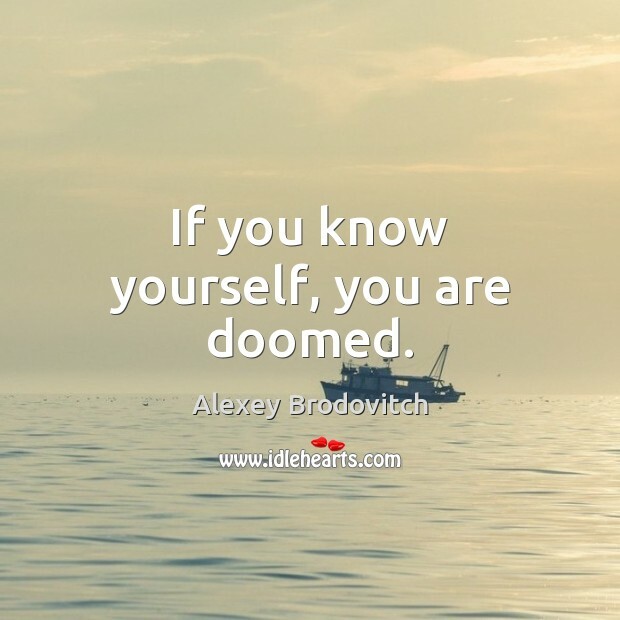 If you know yourself, you are doomed. The personality and style of a photographer usually limits the type of subject with which he deals best. 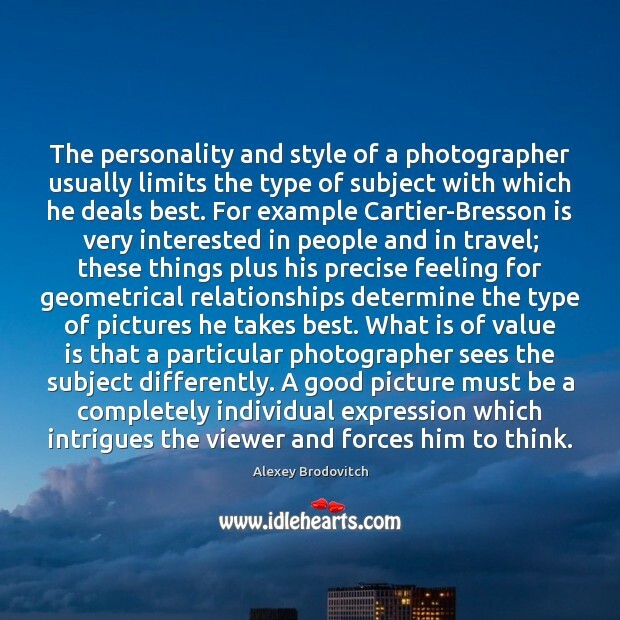 For example Cartier-Bresson is very interested in people and in travel; these things plus his precise feeling for geometrical relationships determine the type of pictures he takes best. 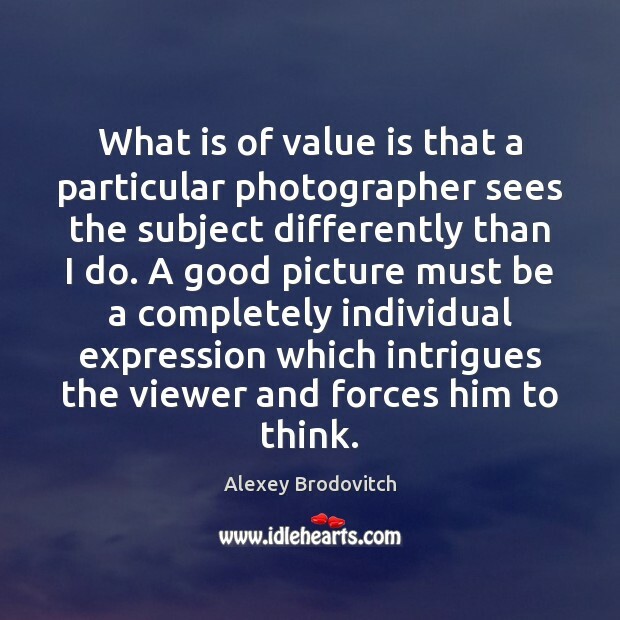 What is of value is that a particular photographer sees the subject differently. A good picture must be a completely individual expression which intrigues the viewer and forces him to think. 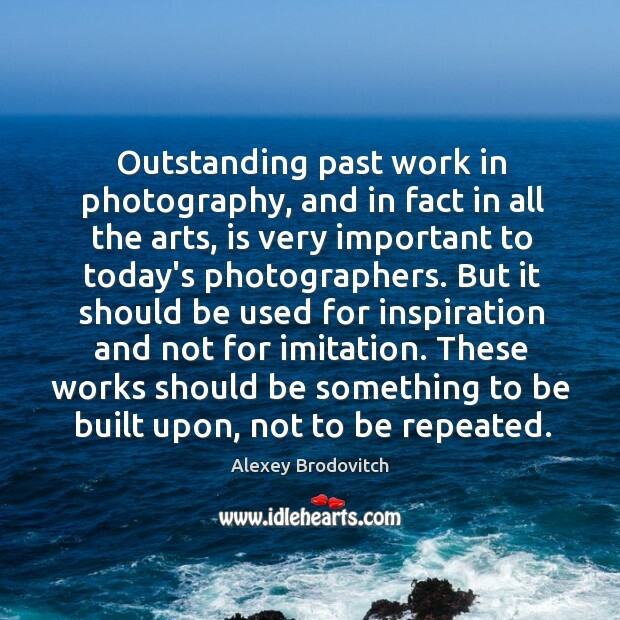 Outstanding past work in photography, and in fact in all the arts, is very important to today's photographers. But it should be used for inspiration and not for imitation. These works should be something to be built upon, not to be repeated. 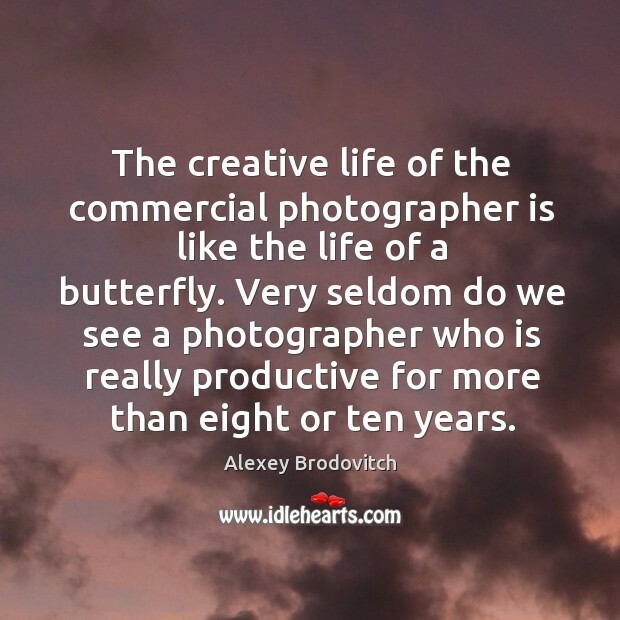 The creative life of the commercial photographer is like the life of a butterfly. Very seldom do we see a photographer who is really productive for more than eight or ten years.